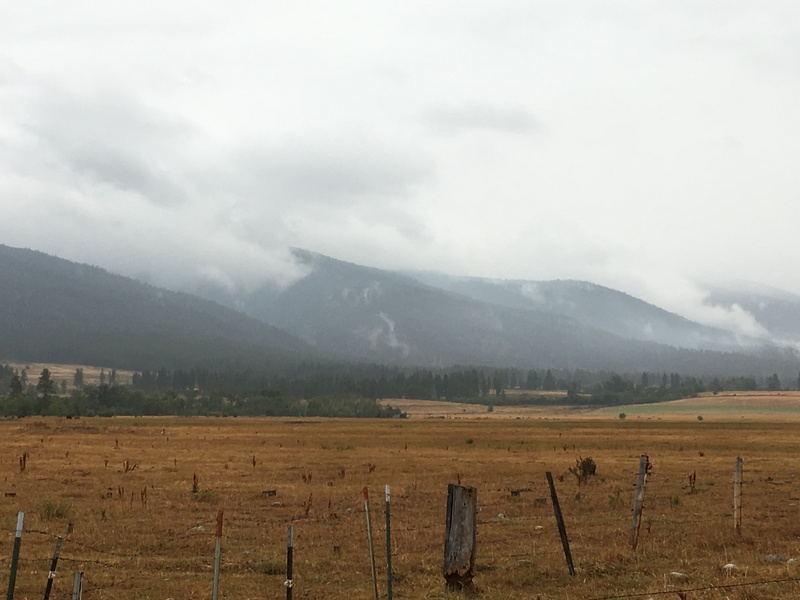 About two hours after my last post about the forest fire on Wednesday the 13th, it started to rain. The rain clouds parked over our area for two days with a light drizzle. Snow appeared on the mountain tops. In all the years we have been here, we have NEVER had snow on the mountains in September. The temps went from near 80 degrees to mid-forties within a couple of hours. We are now experiencing what I would call normal fall weather for this area. Needless to say, we are very relieved. Those are clouds in the picture at right, with only a little smoke coming from fire spots that are still active. It really felt like the beaming just turned off, like flipping a light switch. Instead of evaporating, the rain clouds parked over us. The temps fell by 40 degrees. I don’t know if this is what finally did it, but Stevo was given a power word to say for Rain, which he did on Monday. The forecasted rain then happened, instead of drying up like it has for the past two months. On Thursday, we were exhausted. I think because we were able to stand down on the energy work and we didn’t have to deal with all the angst of all the people who were worried about this fire, our bodies finally took a much-needed day off. It was really interesting that even after the rain started and it was obvious that the weather had changed seasons, the forest service continued to try and pump up the angst, saying that the rain wouldn’t be enough, blah, blah, blah, there’s still significant fire danger, blah, blah, blah. 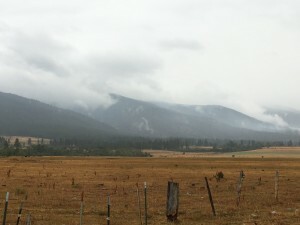 This is while we had clouds clinging to the mountains directly on top of the fire! They wouldn’t lift our evacuation warning until TODAY. We now have normal clouds and blue sky with super clear air. Yay! I hope the cool, wet weather is continuing! Michigan had one of the coolest Augusts I’ve ever experienced. Completely unreported, of course. Now it’s getting hot again. The seasons are shifting, the sun is releasing huge flares, and man continues to pretend that rich men can control nature and become gods. The earth is cleansing itself, purging all the negativity, death and chemicals. It’s going to be tough going but for those that make it through will be blessed with renewal. Much love to you all. Daily prayers to the divine for all those human, animal, plants currently suffering. I hope the worst of it is over for you. Hi, I live in Montana too, Bozeman, Belgrade area, curious where you are. Thankful for the rain, we got about 1 1/3 inches. So fabulous! So happy, prayers continuing. We got 40″ of rain in 2 days at our Houston area house (but no damage), most of Florida is flooded, could you slow down the rain making just a little? ….Just kidding, glad weather conditions better for you know.